Keynote speaker Abdul-Malik Muhammad addresses those attending the Graduate Students of Distinction event. Celebrating at the Graduate Students of Distinction event are keynote speaker Abdul-Malik Muhammad, Barbara Romero, a graduate student in biological sciences, and Carol Henderson, vice provost for diversity. 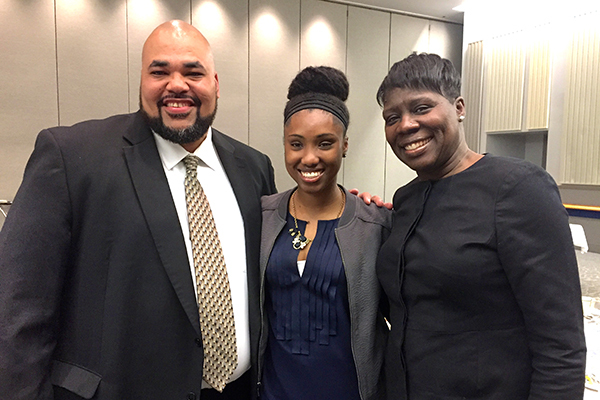 Celebrating at the Graduate Students of Distinction event are keynote speaker Abdul-Malik Muhammad, Latoya Watson, a graduate student in educational leadership, and Carol Henderson, vice provost for diversity. 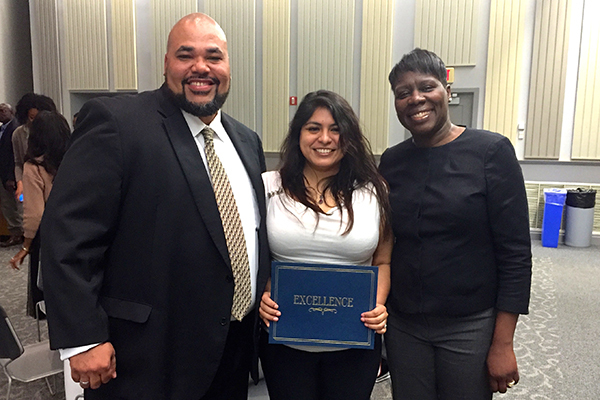 1:46 p.m., May 8, 2015--More than 130 underrepresented graduate students with grade point averages of 3.75 or higher were recognized for their academic achievements at the University of Delaware Graduate Students of Distinction Luncheon held Friday, May 1. The special event, which was hosted by Carol Henderson, vice provost for diversity, celebrated the accomplishments of the University’s African-American, Latino and multi-racial students. Keeley Powell, director of graduate diversity initiatives, joined Henderson in congratulating the talented group of students. The event was attended by 30 graduate students, who were joined by guests and UD faculty and staff members. 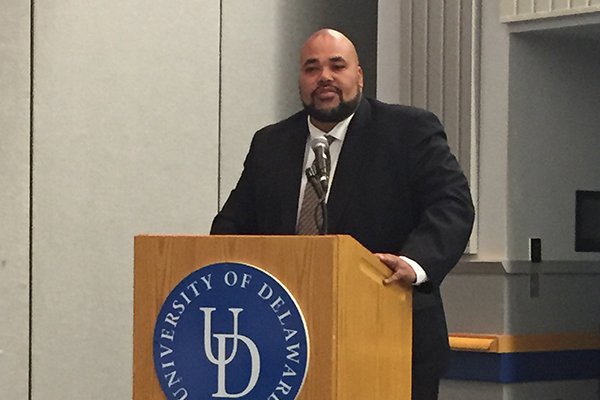 UD alumnus Abdul-Malik Muhammad, who earned his doctor of education degree in educational leadership in 2014, served as keynote speaker. Muhammad is vice president of Providence Service Corp., Human Services Division, as well as consultant, trainer and president of Akoben LLC, and has served at-risk youth and adults for more than 15 years. Muhammad shared his educational journey as a first-generation college student who overcame poverty and the loss of his parents to earn a doctorate and build a successful career.